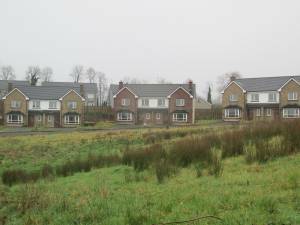 Question: In relation to the Unfinished Development (UFD) of 6 houses at Cnoc Na Gréine, Tydavnet Village, and the fact that these houses remain unfinished and unoccupied for well in excess of 12 years and despite the fact that there is an acute shortage of houses for sale in the area and that a demand for such houses exists and the fact that Monaghan County Council have tried on a number of occasions to negotiate with the new owners in recent years to ensure a resolution and completion of this development to no avail will Monaghan County Council now consider doing a Compulsory Purchase of this UFD and when complete put the houses up for sale on the open market? The Village community welcome the recent enhancement works carried out by Monaghan County Council at this site. Reply: Monaghan County Council has offered to purchase six unfinished houses at Cnoc na Gréine however the Developer has indicated that as market prices are increasing to a level that will make completion of the houses feasible there is an intention to complete the houses and sell them on the open market in the near future. Monaghan County Council has considered the possibility of acquiring the houses through the Compulsory Purchase Order (CPO) process, however given that market prices are increasing and the houses in question are not considered to be derelict the CPO process will not be used at present. Monaghan County Council will keep the situation under review and will consider acquisition of the houses through the CPO process if the houses do not come to the market.